Some people don't even knock before entering. The jerks! 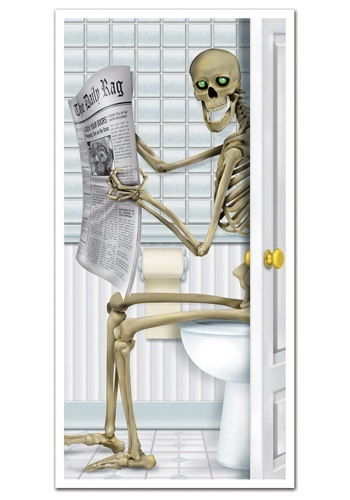 That's a dangerous habit to get into, especially since they never know what will be lurking on the other side—like a skeleton using the can. There are a few things you could do to achieve this end. We vote in favor of you teaching them a good, ol' fashioned lesson. Like tarring and feathering them in the streets. Or, if you're feeling semi-merciful, take from Kevin McCallister's Christmastime Defense playbook: stick a hot iron on the doorknob, set up a trigger-activated blowtorch at the entrance, or surreptitiously lay toy cars on the linoleum floor. That'll show the jerks. Okay, okay, so tact and grace aren't really our things. We concede that. And if you weren't exactly with us on the aforementioned, this door cover is a good teaching tool for the lesson. Low light is key. Screams and soiled garments are evidence that our scheme was a success. High fives in advance!